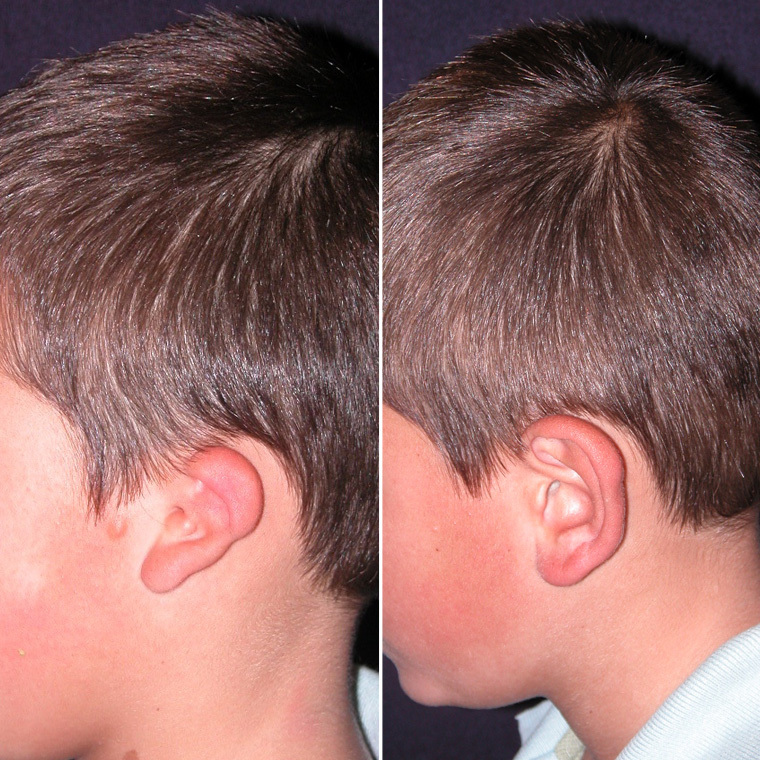 Microtia refers to the condition of an underdeveloped ear; the Institute specializes in assisting patients with microtia conditions and has pioneered reconstructive surgery techniques in this area. Dr. Ruder performs two main types of ear surgery. One is the traditional ear pinback, for ears that protrude or ears that are large. The other is ear reconstruction for children who are born without one or both ears. 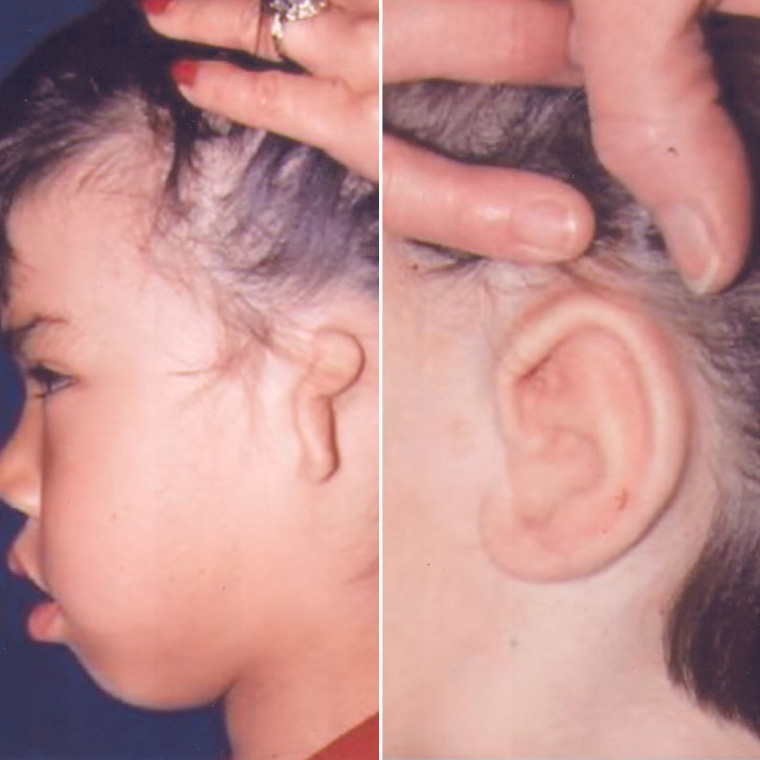 The ear deformity of congenital microtia is typically associated with congenital atresia, an affliction that can cause devastating physical and psychological trauma in children. Through ear reconstruction, the child ends up with a reasonable facsimile of an ear, through a series of surgical procedures, with minimal complications. HOW SOON SHOULD MY CHILD SEE A PLASTIC SURGEON? Dr. Ruder underscores the importance of a child with congenital microtia and atresia seeing both a plastic surgeon and an otologist as early as possible.  That way, a plan can be devised to correct both defects–aesthetics and hearing. From the beginning, the ear-surgery project should involve the child and his family. Repair over a period of time, in stages, allows adequate time for healing between operations, and thus, optimal results. 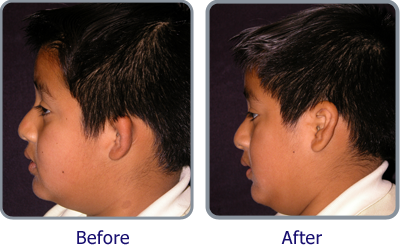 Dr. Ruder will show you photographs of comparable surgical procedures that he has done on other children to give you a realistic idea of what surgery results look like. WHEN CAN A CHILD HAVE SURGERY? Dr. Ruder begins surgical reconstruction of the external ear when your child is about six because that’s when there is enough rib cartilage to use for the framework. Also, your child is mature enough to cooperate in post-op care. “In a child with bilateral microtia and atresia, we may do surgery at a younger age, because this would provide the otologist with the opportunity to restore hearing in at least one ear before the child starts school,” explains Dr. Ruder. At the same time, though, Dr. Ruder cannot perform surgery until there’s enough cartilage. By the time a child is six, his ear has grown to about 85 percent of its adult size, and the rib cartilage is usually large enough to allow “harvesting” and the fabricating of an adult-sized ear framework. Dr. Ruder will examine the ear and ear canal and discuss options. 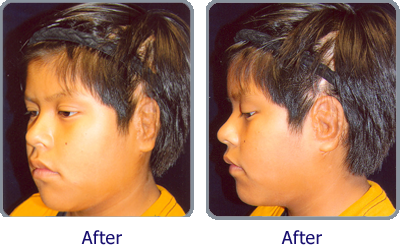 Atresia (hearing) repair can be successfully done only in cases of one-ear involvement. Dr. Ruder will take photos of the ear or ears. Ideally, the otologist will examine the patient at the same time as the plastic surgeon (if not, during the same week at least). As soon as the otologist determines whether the hearing can be restored, he will inform the family. Your child will have two highly technical evaluations: One uses an audiogram or auditory brain stem response (ABR) testing; the other involves a CT scan. For an audiogram, a child must be old enough to respond correctly to sound stimuli and spoken words. Thus, it’s of no value with newborns. But ABR testing can provide an accurate indication of a newborn’s sensorineural hearing capabilities and also assess the amount of conductive loss present. Furthermore, it can identify the better hearing ear. * No hearing aid is required in a child who needs one ear reconstructed and has normal hearing in the other ear. A child with perfect hearing in one ear will do well in speech development and school work. Those with no hearing and two ears in need of reconstruction require the placement of a bone-conducting hearing aid. In the case of a newborn with bilateral atresia, a hearing aid should be placed immediately. Using the anatomic information provided by the CT scan, the otologist determines whether the child is a candidate for the reconstruction required for hearing repair. The best age for obtaining this information is four to six. Some patients have post-op hearing improvement to normal or near-normal levels. STAGE I: During ear framework construction and placement, Dr. Ruder harvests rib cartilage and trims and sculpts the removed cartilage to proper dimensions. He prepares the microtic ear for the implant. The cartilage is dissected. A skin flap is elevated posteriorly after removal of the vestigial cartilage. Dr. Ruder places a suction drain; he inserts the cartilage framework and positions it; and he connects the drain to suction. The ear is packed with gauze, and he applies a large fluffy dressing. After Stage I, the patient will stay overnight in an observation unit. Antibiotic ointment should be applied until all sutures absorb; chest steri-strips will come off naturally. The day after surgery, the patient will sit and walk for short periods. The third day, he walks freely. Suction drain removal takes place after four days; the dressing is removed on day seven. On the 10th post-op day, the subcuticular suture is removed. The child can swim two weeks after surgery; in three to four weeks, he can resume all normal activity. Phys ed in school should be postponed for four weeks. STAGE II: Since the second surgery deals with only soft tissue, the patient experiences very little pain. The ear dressings are removed the day after. Ointment is applied to suture lines until all have dissolved. Swimming and sports can be resumed in two weeks. In this stage, an otologic surgeon repairs the hearing–congenital aural atresia. He creates an ear canal and lines it with a skin graft. Surgical maneuvers align the new canal with the ear framework. The new meatus must be made twice the desired size because it has a tendency to constrict the first few months after surgery. The otologist will provide post-op care instructions. STAGE IV: During Stage IV, Dr. Ruder creates a tragus by taking a composite cartilage graft from the contralateral ear and placing it on the framework. He sutures the graft to the anterior limb and harvests a skin graft from the posterior portion of the ear and sutures it to the edge of the graft. The base is pulled forward to create the tragal eminence. The skin graft is held in place with gauze, bolstered by steri-strips for stability. Dr. Ruder removes the head dressing the day after surgery. Ointment must be applied religiously. Dressings and sutures are removed on day seven. By the second post-op week, the upper layer of skin graft lining the graft has sloughed. All activities can be resumed at this time. STAGE V: Dr. Ruder elevates the cartilage framework from the side of the head. The procedure involves two separate sites: (1) the reconstructed ear, and (2) the donor site for the skin graft (buttock or inner arm). A stent, held by sutures, provides support for the elevated position and pressure on the skin graft. It’s important to maintain the degree of elevation because the ear must remain slightly overcorrected and extended at about a 90-degree angle to allow for retraction during healing. The first post-op day of Stage V, Dr. Ruder removes the head dressing. The stent is taken off on the fifth day by cutting overlying sutures. For two weeks, you apply ointment to suture lines and keep the area dry. During the first post-op day, if the donor site has blood collected under the dressing, Dr. Ruder will remove this by simple aspiration. During the next week and a half, the dressing peels off naturally. Dr. Ruder will encourage your child to wiggle the ear back and forth to increase flexibility and to prevent readherence to the side of the head. Return visits are weekly for one month, then monthly for five months. Ideally, your child should come in for checkups once a year indefinitely. 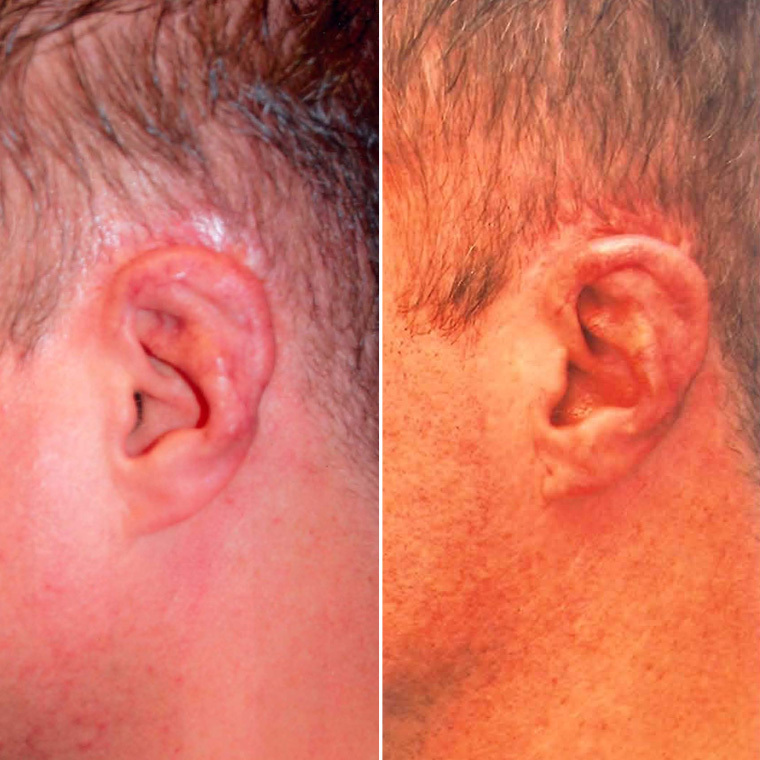 Usually a two- to three-hour procedure, otoplasty requires making an incision behind the ear to expose ear cartilage, which Dr. Ruder then sculpts to bend the ear back toward the head. Or he can fold the cartilage back onto itself, which allows the ear to reshape itself without cartilage removal. For an ear pinback, Dr. Ruder can sew non-removable stitches concealed behind the ear. WHAT KIND OF RECOVERY IS INVOLVED? Most people won’t need an overnight hospital stay, and the average person is up on his feet a few hours after the procedure. You may experience a mild ache for a few days (you’ll have medication to dull any pain). Recovery for adults is five days; for children, it usually takes seven days. After that period, you can return to work or school. Avoid bending your ears for the next four weeks.